Recently the office attended Gallerite Reingage Convention, a dental seminar in Las Vegas. It was a fantastic opportunity to take in information on Invisalign. While browsing the exhibit hall, a particular booth caught my eye. It was an On-The-Go Cleaning and Whitening system specifically for aligners and retainers, which is perfect for our office since we provide Invisalign. Invisalign is a great orthodontic option and gives the patient the ability to keep their mouths clean without the fuss of wires and brackets. The Invisalign aligners are easy to use but can build up bacteria throughout the day. It is vital to clean the aligners and brush your teeth each time you put them back into your mouth. Sometimes cleaning the aligners is a difficult task as some may not have access to a bathroom. This is where the WHITE FOAM On-The-Go Cleaning and Whitening comes into play. It will whiten your teeth too! WHITE FOAM comes in a pump which is super easy to use. No toothbrush or water is needed. It will clean your aligners, kill bacteria all day and freshen breath. Not only does the formulation clean and cleanse, but it will whiten your teeth too! This product is gluten-free, sugar-free, vegan-friendly and animal cruelty-free. 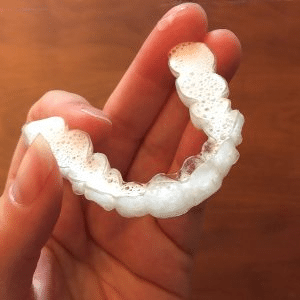 WHITE FOAM is compatible with Invisalign aligner trays, ClearCorrect aligner trays, bleaching trays, dentures/partials, Essix retainers, Vivera retainers, and Hawley retainers. Of course our staff and family tried the product, and we all loved it. We liked it so much that we are giving our patients that have Invisalign with us a free gift as a part of their treatment. The office will be keeping more on hand if others are interested. Thank you Las Vegas for introducing us to such an excellent product. 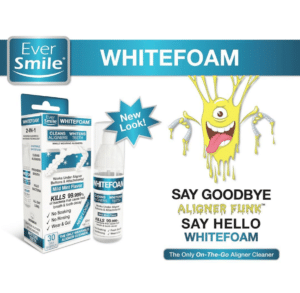 If you wear aligners and you would like to try Ever Smile’s WHITEFOAM, stop by our office and pick up a box. compass dental: Strange but true. Thanks, For the availing informative blog about WHITEFOAM. it’s really helpful to those people who don;t know about this thing.